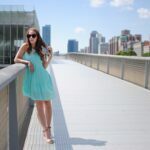 Today’s post features another stellar Chicago mural and a festively fun off the shoulder yellow dress. I could easily have spend another week in Chicago to get to all the things that I wanted to see and do. Hopefully I can get there again soon. When you wear this dress, you feel like dancing! This off the shoulder yellow dress has the perfect ruffle at the top, which makes it 10 times cuter. I am so into yellow right now. I ended up taking 3 different yellow dresses with me on my trip. It is such a great colour for summer. I paired this dress with some comfy brown cork wedges (from last season but linked same brand this season) and a great clutch that seems to go with everything. Who needs a little black dress when you can have a little yellow dress! If you are feeling blue, try painting yourself a different colour. This is a mural in Chicago (West Loop neighborhood) by Pose has colours to match any outfit. ? Have a great Wednesday, friends! I have a to-do list a mile long today and I work this evening. Busy, busy! !